The first day of our field season is complete. Not much to report, however, as the day was cloudy with rain off and on, enticing many monarchs to stay still and hidden. It was the first day of field work for Diane Tassey, our new Field Naturalist, and after observing the day's first two censuses she conducted her first census on her own at 3:00 pm today. Here's Diane preparing to put the caution sign on here car prior to conducting that census. She also tagged two monarchs today; there were more monarchs around, but for most of the day they were wet and we don't handle wet monarchs, they're too easily damaged. Our morning was dominated by visit with a reporter and a photographer from the Press of Atlantic City, who hope to publish a story about our project in the newspaper next week. They also promise to return later in the season when the migration is in full gear. It was the first day for the Cape May Hawkwatch as well, and this year's hawk counter, Erik Bruhnke, brought splendid sartorial style to his post in celebration. For the next two months Cape May Point will be a busy place for natural history research and education. 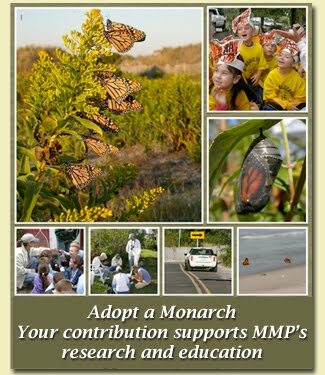 We will be counting, tagging, and teaching about monarch butterflies. Our birding friends with the Cape May Bird Observatory, our parent organization, will be counting hawks, songbirds, shorebirds, and about anything else that's flying south. We hope that many of you will join us south of the Cape May Canal, where (according to the creator of the sign posted on the Rt. 626 bridge over the canal) South Jersey begins. Don't come to Cape May this weekend, however, without checking the weather reports. Tropical storm Hermine has the potential to develop into a nasty hurricane that could have significant effects on Cape May. We'll be watching carefully, hoping there's no need to evacuate. We will post more when we know more.